Ruth H. Schowalter, 71, died June 15, 2006 at her North Riverside Drive, Town of Saukville home after a brief battle with cancer. She was born August 14, 1934 in Port Washington, Wisconsin To August and Katherine Thoma Begusch. She met Robert Schowalter of Saukville, Wisconsin and they were married February 13, 1954 at St. Mary’s Church in Port Washington, Wisconsin. Ruth operated Ruthe’s Ceramics in Saukville for over twenty years. She enjoy travelling with her husband and went on many motorcycle trips throughout the country. 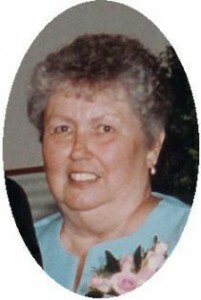 She also enjoyed gardening, flowers, the outdoors and her home. She is survived by her husband Robert, children Jeff (Ellen) Schowalter of Port Washington, Karen (Paul) Wilkens of Newburg, John (Judy) Schowalter of Fredonia and Richard (Sue) Schowalter of Saukville. Further survived by grandchildren Michele Matheny, Matthew Schowalter, Daniel Wilkens and Katie Wilkens, sisters Sister Mary Benet of Stone Bank, Wisconsin and Betty Buser of Franklin, North Carolina, brother-in-law Ron(Betty) Scholwater of Port Washington, other relatives and friends. Preceded in death by a daugher Joanne and a grandchild Kelly Schowalter.